Skinner Presents Clocks, Watches & Scientific Instruments at Auction on November 1 | Skinner Inc.
MARLBOROUGH, MA – October 11, 2014 – Skinner, Inc. will hold an auction of Clocks, Watches & Scientific Instruments on November 1, 2014 in Marlborough, MA, featuring European, American, and Japanese clocks. From enameled French mantel clocks to an impressive selection of tall clocks as well as antique and modern watches, the auction offers something for everyone with an interest in horology. 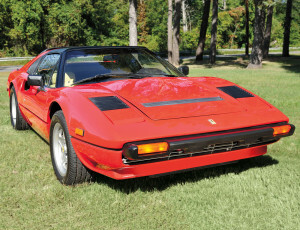 In addition, the auction features antique vehicles and a selection of Historic Arms & Militaria. 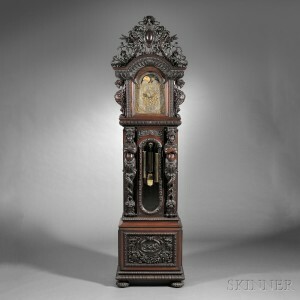 A masterpiece of Victorian clock-making leads an outstanding selection of tall clocks, also known as “Grandfather” clocks. The elaborately carved mahogany case is attributed to R.H. Horner & Co. of New York, and the dial is signed by Tiffany & Co. (Lot 447, Estimate $90,000 to $120,000). For over eighty years, the clock stood in the W.P. Brown mansion in New Orleans. It was there when Florieda Batson, captain of the first Woman’s World Games in Paris, 1922, moved into the home with her family in 1930. The Women’s World Games were a prelude to allowing women to compete in the formerly all-male Olympic games. Batson’s many silver trophies adorned the mansion along with the clock. A quarter-striking long case clock by John Bushman of London (Lot 417, Estimate $10,000 to $15,000) and a month-duration clock by Joseph Norris of Amsterdam (Lot 418, Estimate $5,000 to $7,000) are both excellent examples of early 18th century clockmaking. The auction features watches from the late 17th century through the modern day. A silver pair-cased verge watch (Lot 350, estimate $2,500 to $3,500) was made in London circa 1700, and an Omega Speedmaster stainless steel chronograph wristwatch is the same model that was approved by NASA for space travel and worn on the moon (Lot 379, estimate $1,000 to $1,500). Mantel clocks, skeleton clocks, table clocks, and regulators will also be offered. A gilt bronze and enamel mantel clock attributed to Brocot of Paris, c. 1860 (Lot 433, estimate $3,000 to $5,000) is a beautiful clock that survives with its glass dome intact. Skinner regularly achieves record prices for E. Howard & Co. clocks and astronomical regulators, and this auction includes several offerings from the famous Boston-area manufacturer. A group of rare Japanese clocks (Lots 400 to 404, estimates vary) come to auction from a private collection. Don Yeier, an optical specialist, collected telescopes for forty years. Skinner will present a group of floor and library telescopes from the mid-18th century through the present day from his extensive collection. 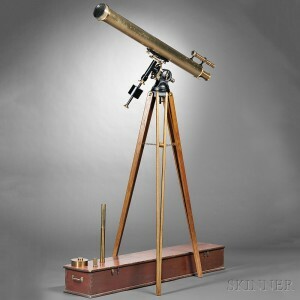 A reflecting library telescope by James Short of London (Lot 288, estimate $5,000 to $7,000) represents early optics, and a refractor telescope from the late 19th or early 20th century (Lot 299, estimate $15,000-$25,000) is an exceptional example by Alvan Clark & Sons of Massachusetts. The auction also includes a collection of 18th to 20th century eyeglasses along with early chest and door locks, padlocks, and keys. An illustrated catalog for Clocks, Watches & Scientific Instruments and a separate catalog for Historic Arms & Militaria are available from the Subscription Department, at 508-970-3240, or from the Gallery. Prices realized will be available online at www.skinnerinc.com, both during and after the sale. The Skinner website enables users to view every lot in the auctions, leave bids, order catalogs and bid live, in real-time, through SkinnerLive! This entry was posted in News and tagged american clocks, antique vehicles, Clocks, E Howard, Ferrari, Ford, french clocks, grandfather clocks, historic arms, horology, Japanese clocks, long case clocks, Militaria, Robert Cheney, scientific instruments, tall clocks, telescopes, watches by Skinner. Bookmark the permalink.